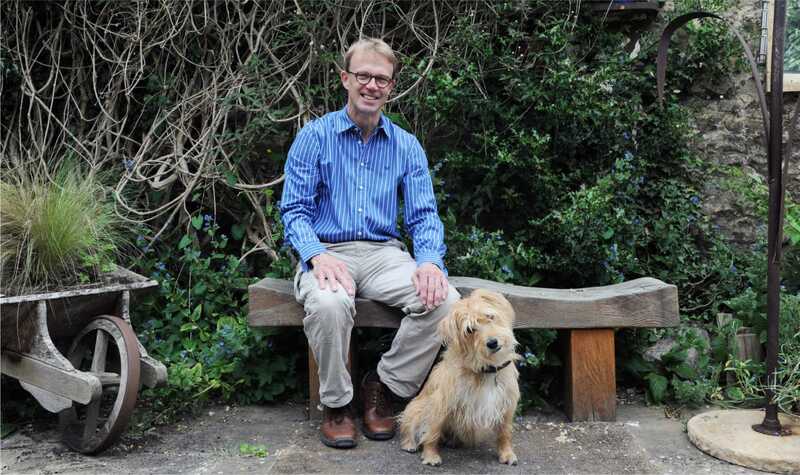 Chris Baylis, principal of The Real Wood Furniture Company is passionate about the furniture made by the company, about his music and about ‘Scrumpie-pup’, the second dog of furniture and meeter and greeter at the company’s showrooms. Since 1989, The Real Wood Furniture Company has established a reputation for quality, attention to detail and integrity, attracting customers from far and wide to view their unique collection. 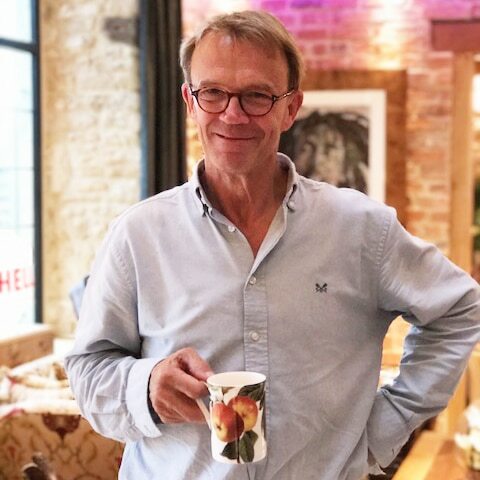 The company has recently relocated to larger showrooms in a beautifully restored former Coaching Inn, one mile North East of Chipping Norton town centre. New designs have been added to the unique collection of hand crafted English oak, burr oak, and ash country furniture with elm, walnut, forged steel and glass added to the mix of materials that the company works with. Leaving Surrey University in 1976 with a degree in German and Swedish with economics, and seeking ‘rock and roll stardom’, as a guitarist, but not wanting to be a ‘broke’ musician, he engaged in various short term jobs whilst plying his music, before meeting up with a successful antiques dealer who tasked him with sourcing as many antique English country chairs of various styles as he could find. This was an era when the antiques trade was in full flow and Chris quickly became good at finding chairs. Within months he was buying for himself as well as for his dealer friend and over the course of the next few years handled literally thousands of antique Windsor and rush seated chairs, becoming well known in the trade as ‘The Chairman’ and developing a love for form and finish. Even his fellow band members were involved in the business, stripping and polishing sets of chairs in the outbuildings of the house they shared outside Farnham. Music was not left on the ‘back seat’ however and with his new band ‘SIAM’ he signed to A&M records in 1979, headlining gigs at London’s Marquee Club and supporting bands such as Squeeze and The Ramones. The antiques trade was in full flow, and so was his music! As the years progressed, he started to buy and sell good pieces of country furniture and by handling and selling over time gained great knowledge of proportion, style, design and finish, such that by the time his main ‘buyer’ retired, he was able to take on the mantle as one of the biggest suppliers of matched sets of country chairs to the antiques trade, with a stock of well over 1,000 chairs and a burgeoning business. It was during this period that he also set up his own recording studio and engineered and produced for bands as diverse as Red Box, Maddy Prior, Automatic Dlamini (John Parish & PJ Harvey) and more. He also spent a very interesting two weeks playing guitar at Peter Gabriel’s Real World Studios on the 'Big Vern' album, 'Lullabies', produced by John Cale…heady times in furniture and music! 1989 saw the first recession in the antiques trade and a general ‘shake up’ of the market. It was at this time that several of Chris’ American trade clients began to complain about the cost of the antique sets of chairs he was supplying and the lack of comfort. They also noted the lack of a properly made ‘reproduction’ (we hate the word!) on the market and Chris was encouraged to ‘sort the problem’. Thus he set about re-designing initially a Windsor side chair and a ladder back side chair, amalgamating the best individual features of the many chairs he had handled over the years into two new chairs, larger in form than their period counterparts and providing greater comfort….and thus, the ‘die was cast'. A methodology and ‘blueprint’ was established whereby the aesthetic appeal of the period chairs was retained whilst also fulfilling ‘functionality’ for the size and life style of late 20th century man and woman. Chair and cabinet makers alongside polishers were sought out who could work to Chris’ exacting standards. This ‘blueprint’ led to the making of a wider range of chairs, tables and dressers for an ‘evolving’ antiques trade. Chris’ musical career saw him forming ‘The Guitar Orchestra’ and the release of their first CD in 1990 saw the combining of his passions, with the album cover depicting an ‘orchestra’ of antique chairs, each with a guitar laid against it on a deserted beach in South Wales. The Guitar Orchestra played at arts centres up and down the country, including a week in the foyer of the Barbican Centre and ‘an evening with’ at ‘The Purcell Rooms’. A ‘furniture’ problem however began to emerge in that Chris’ trade customers were keen to keep costs to a minimum whilst Chris’ ethic was to make the best pieces possible. These two goals were ultimately unreconcilable and it was at this point that the company started to engage with end market customers, exhibiting at lifestyle and interiors shows up and down the country. This led to the opening of the first retail premises in 1996 in Woodstock. A move 4 years later to larger and more centrally located premises put the company well and truly on the map. The move into serving a retail clientele allowed Chris to expand on his traditionally based designs and it was at this point that his love of the simplicity of early Chinese furniture design, Arts and Craft’s furniture and his passion for beautifully grained English timbers began to find expression. Although the company still offers its range of traditionally styled furniture, Chris has over time developed and brought forward new designs and finishes, that fit perfectly in a contemporary setting. For example, the ‘Signature’ series tables see extreme figured burr oak and walnut combining with forged steel, stainless steel and glass. Long standing relationships with timber suppliers give the company enviable access to some of the finest British country timbers, and the company's collection includes pieces with beautiful grain and mixed use of timbers, such that each piece becomes truly unique. The company has recently moved ‘off the high street’ of Woodstock and is now trading from a beautifully converted old Coaching Inn outside Chipping Norton. We hope you will visit the showrooms soon, to browse at your leisure, seek inspiration, touch and enjoy! Postscript: The early 2000’s left little time for music, but in recent times Chris has linked up again with 12 string guitar maestro Tony Poole (Starrey Eyed & Laughing). ‘tp & woodman’ have performed at several festivals including The Cornbury Festival and are regulars at ‘Woodstock Live’ a festival that Chris masterminds every year over the August Bank Holiday weekend. His passions for furniture and his music both run deep!